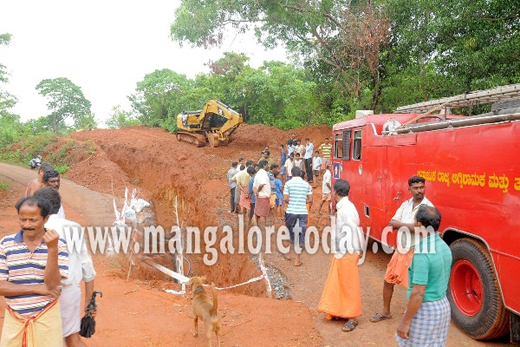 Bantwal, May 14, 2015: As per reports tension ruled Peerdabettu village near Panjikallu in Bantwal Taluk on May 13, Wednesday morning. The villagers noticed fuel leakage from PMHBL (Petronet Mangalore Hassan Bangalore Limited) Pipeline. Local residents have alleged that negligence of the officials of PMHBL pipeline is the main cause. According to local people, leakage was noticed by labourers who were walking to work beside the road and smelled diesel fumes and informed the local people. Soon a crowd gathered at the spot and called the numbers displayed on a near-by board without any response. After three hours of searching officials were informed who reached the spot and strated repair work. The residents state that the work on laying gas pipeline is in progress. What is the guarantee that the gas pipeline will be safe? Gram panchayat president Sanjeev Poojary and former president Sudarshan Jain said that in the name of laying pipelines, the road, drains have been dug. The district administration should initiate action against the authorities. What is the guarantee that the villagers will be safe from the gas pipeline? they asked. By evening, the officials from Petronet Mangalore Hassan Bangalore Limited rectified the leakage and the residents got relief. The officials suspect lightning may have caused minute cracks in the pipeline and fuel flowed in to fields.